Cumin is native to parts of the Middle East and India. Cumin seeds can be used to add an aromatic, earthy aroma and warm, smokey flavour to many dishes. Freshly ground cumin seeds can be mixed with other ground spices and pureed onion to make a smoky aromatic base for curry, chilli or stew. Whole cumin seeds can be used to flavour home-made cheeses and breads, or used in combination with other herbs and spices to flavour pickling liquids. Cumin produces the greatest quantity of seeds when grown in full sun, although it can also be planted in light shade especially in hot climates where the plants may otherwise wilt during the hottest parts of the day. Cumin grows best on a sandy-loam soil rich in organic matter, if your soil is lacking place down a layer of compost or well-rotted manure prior to sowing cumin. Cumin will struggle to grow in heavy clay soils. Cumin foliage is dainty and allows a lot of light through to the soil, because of this weeds will germinate readily around cumin plants and they'll need to be regularly weeded. Weeds that are not removed will out-compete the dainty cumin plants and reduce seed production. Avoid watering cumin plants after they have flowered as too much humidity at this stage can cause the developing seeds to become mouldy. Cumin plants can suffer from fungal issues which can kill young plants or reduce seed yields in older plants, avoid over-watering them to help reduce the spread of fungal spores. Cumin is drought tolerant. In cold and mountainous regions of Australia sow cumin seeds from mid Spring to early Summer. In temperate regions of Australia sow cumin seeds from early Spring to mid Summer. In subtropical regions of Australia sow cumin seeds from late Winter to late Summer. In tropical regions of Australia sow cumin during the dry season, from early to mid Autumn is best. Sow cumin seeds 6mm deep. Cumin plants are small only growing to about 20cm tall, so they only need to be spaced or thinned about 15cm apart to provide them with enough room to grow. Cumin plants grow best when seeded directly as they may bolt if transplanted. Cumin seeds are quick to germinate, taking between 7 and 14 days from sowing for the seedlings to emerge. 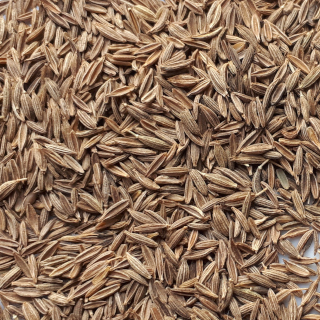 Cumin plants will start producing seed 14 to 17 weeks after sowing. Harvest entire cumin plants once the seeds are mature and the foliage start to die back. Hang the plants to dry then once fully dried shake them to dislodge the seeds.